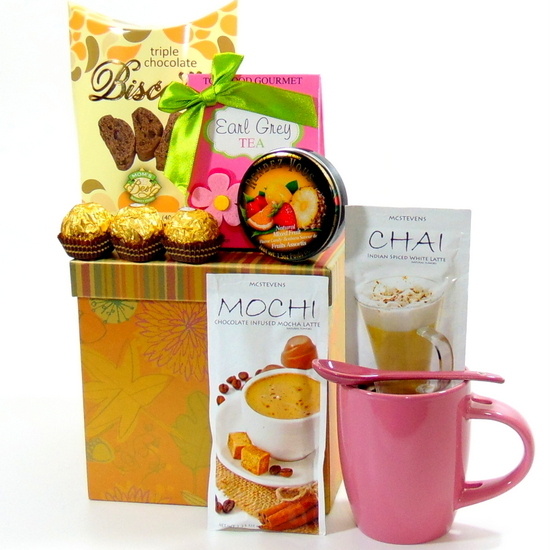 Pink mug gift box, gold gift box with fall leaves filled with pink mug with spoon teas, coffee, cookies, chocolates and candies. Gourmet basket pink mug gift box, gold gift box with fall leaves filled with pink mug with spoon teas, coffee, cookies, chocolates and candies. 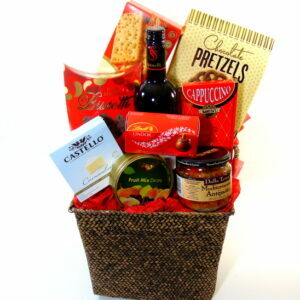 Gourmet basket pink gift contains: Gold fall leaves gift box. Pink Mug with spoon. Triple chocolate biscotti. Too good Earl Grey tea. Ferrero Rocher chocolates. French candies. Chai mix drink. Mochi chocolate mocha drink. Thank You! Happy Birthday! Love You! Get Well Soon! and much more messages and occasions with gift box.